What's your favourite room in your house? I'm guessing it's probably your bedroom (ahhh, sleep), your lounge-room (ahhh, the couch) or perhaps your bathroom (ahhh, sanctuary - lock the door). Mine is our study or home office. Don't get me wrong, I love our lounge-room too, or more specifically the couch, but I have always loved our study. I think because it's home to our books, our photos, the computer, a comfy old wingback chair (not shown in pic) and our phone, and a lot happens in here. It's where the bills get paid, it's where we talk, it's where I shop we shop, it's where I get my craft on, it's where we communicate with friends, it's where I pin memorable or interesting "stuff", it's where Project Life lives - I guess it's the "business" centre of our home. It's also comfortable, it's generally pretty tidy (= clear head for Mumma), it's homely and I always feel relaxed in here. It has sort of become my "quiet place" (that is, of course, until I move into our future home which will have a whole room dedicated to me and all things "Martha"!). However (and there's always a "however", isn't there? ), despite its neat appearance, there's a mountain of work that needs to be done in here. 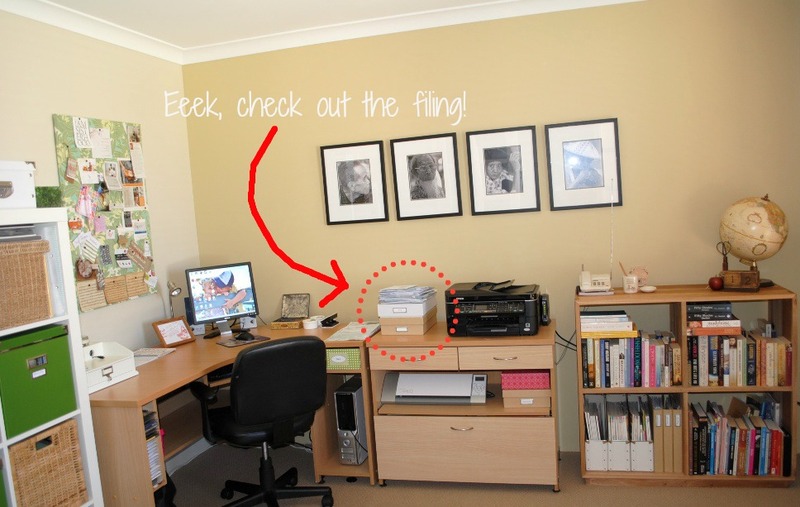 There is a ridiculous amount of filing that has been accumulating for far too long, there are bills to be paid (when aren't there bills to be paid), the drawers are a mess, the filing system badly needs attention and there are photo albums to be filled. I could honestly spend every day for a month in here and still not get everything done ... and when do we EVER have that sort of spare time? So, I am making a small, slow start. I am focussing on just one little area. My 2013 calendar and my 2013 Project Life Photo Planner. Towards the end of December, I realised I didn't have a 2013 calendar but because I normally get one for Christmas or I get a free one with a magazine subscription, I just expected that one would appear. One didn't. The other thing I needed was a 2013 photo planner for Project Life. I used one from The Organised Housewife for all of 2012 (thanks Katrina!) and it proved INVALUABLE for keeping track of and keeping up with the photos I took for Project Life - without it I would've for sure fallen behind within the first few months. For the calendar, instead of rushing out and buying one, I just made one up myself in Word. I used one of their standard templates and then just changed it around a bit, added a few things here and there and then just printed out an entire year. Easy. For the photo planner, I decided to make up my own this year - one that exactly suited my needs. The one from The Organised Housewife is absolutely fine but I wanted to include some extra information that would be helpful to me. For example, sometimes I'll take a photo with my i-phone and sometimes I'll use my Nikon and if I don't note it down somewhere, at the end of the month when I upload my photos for print, I have a hard time remembering which camera I used. And because some of Project Life's layouts are made up of varying print sizes i.e. 6x4, wallet, square etc., I also added in a column to note down the print size - rather than trying to work it out at the end of each month, or whenever it is you print. My 2012 planner sat on my desk, which was great because it was close by but annoying too because it added to the paper clutter. I still wanted my new one to be close, to record photos taken easily, but I didn't want it on my desk again. 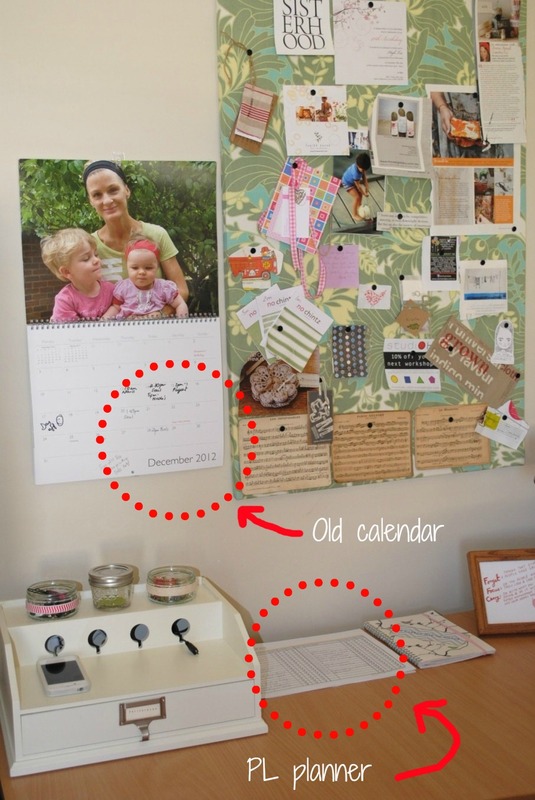 I decided it might be nice to hang both the planner and calendar together, on clipboards. And why settle for a plain old clipboard when you can pretty one up with some bright paper, right? The Supplies for the clipboard. I decided to use the other side of the scrapbooking paper. It's the first time I have covered a clipboard and I actually expected it to be a pretty painful process but it was simple. I just traced around the clipboard onto the scrapbooking paper, cut it out and stuck it on using Modge Podge. I gave it an extra coat of Modge Podge all over for durability. Now it's all fun and pretty. If you are Project Life'ing this year yourself, I have included the Planner here for you. I promise you, it is THE BEST Project Life assistant and will keep you on track and organised! So, here they are - the Calendar and the Planner - together, on the wall, off my desk and ready to head "organised-like" into 2013! What do you think? Do you like my little solution?